Whether you lean towards lavender, soft iris or aubergine, purple is indeed a versatile colour – one that symbolises elements of confidence, counterculture, unconventionality, mindfulness and mystical and spiritual qualities. Pantone 2018 colour works great together with reds, bright green and yellow, that’s to say with all the colour trends for 2018. A good idea to incorporate Ultra Violet into your home could be to add just one piece of furniture, or maybe also, some fabrics and textiles. Furthermore, it could also be used to paint walls. 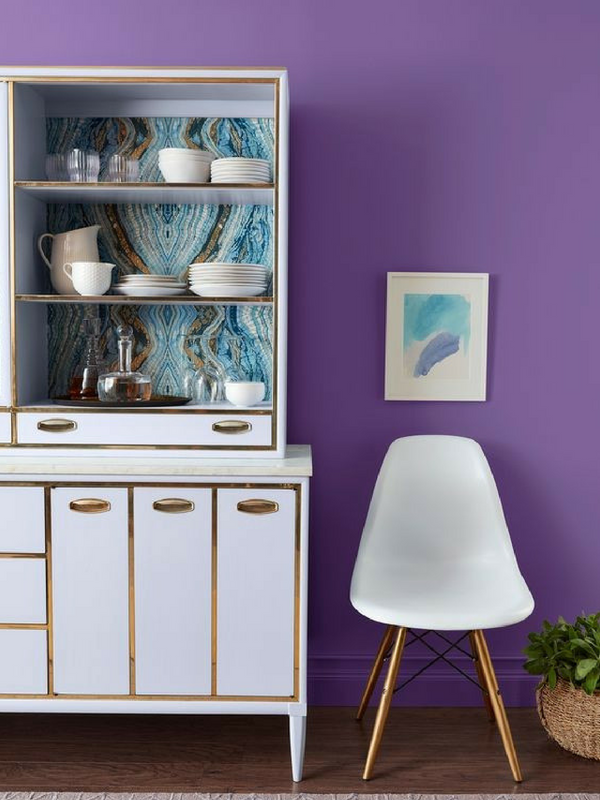 Let us know, what do you think about these ways to decorate with Pantone 2018 Ultra Violet. Late music icons David Bowie, Jimi Hendrix and Prince brought shades of purple to the forefront of pop culture, whilst expressing their own personality. Prince was even honoured with his own purple colour ‘Love Symbol #2’ in 2017, which bears a striking resemblance to Ultra Violet. Lots of people are daunted by the colour purple. But used with confidence, Ultra Violet offers a whole spectrum of opportunities. From highly original interiors full of texture and contrast to blended shades that subtly express one’s own design personality. 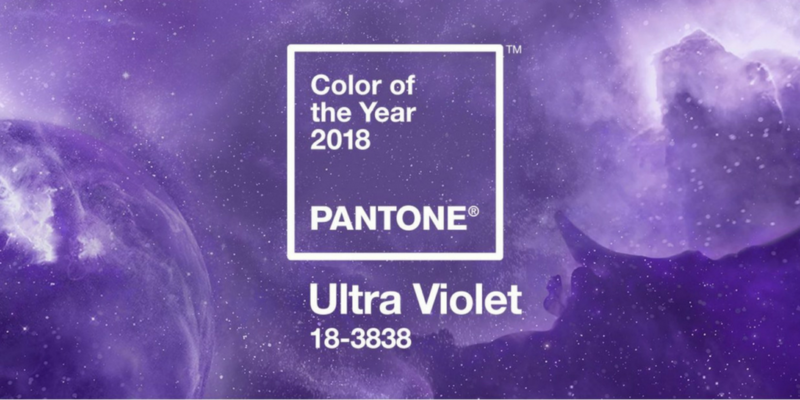 Ultra Violet is a bold, vivid shade, that on the one sense evokes a sense of creativity and fantasy, and on the other, a sense of balance and harmony. The great thing about Ultra Violet is that it can hold its own with a diverse range of colours. If you have a room that’s itching for a fresh coat of paint, consider going with purple. 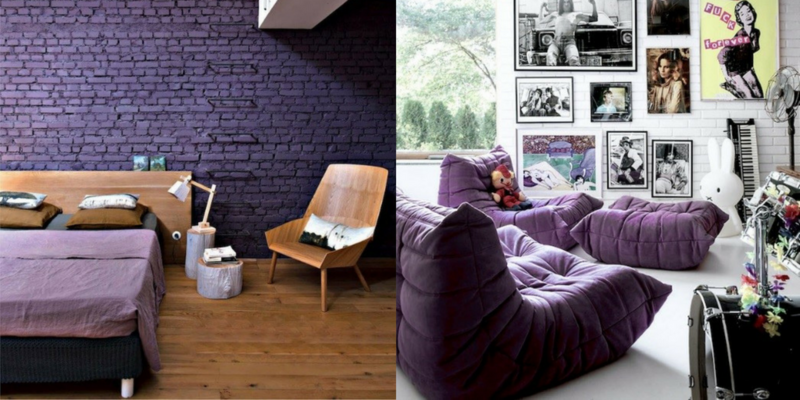 If you really want to embrace Ultra Violet you can paint an accent wall purple. Or use a wallpaper that has purple as its main colour. 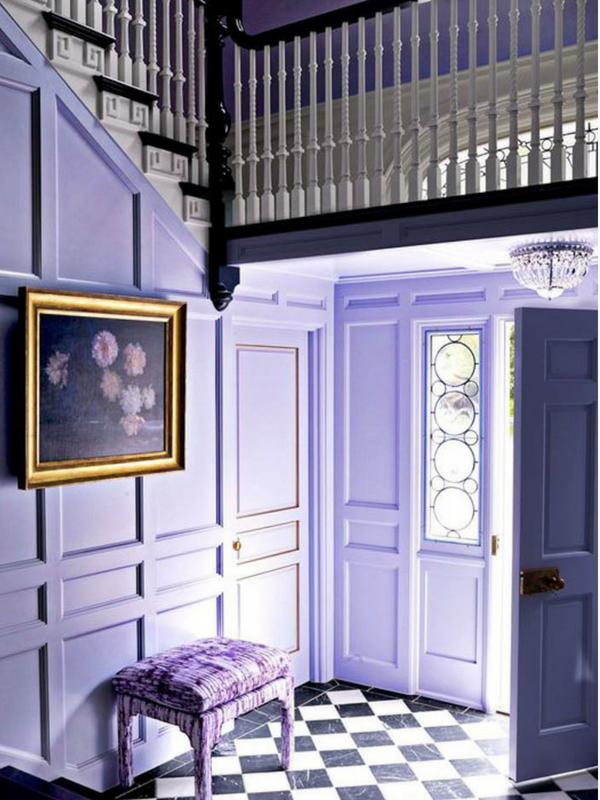 Another easy way to use paint to add purple to your décor is by painting a door (or multiple doors) the royal hue. Whether your exterior door, and interior door, or a closet door that pop of purple is sure to brighten up any space. With minimalism and the use of pastel colours, an ultra violet door, be it your front door or even a bedroom door, is sure to strike an instant interest. The use of a bold colour every now and then is always welcomed. By working with other shades in the same colour family – lilac, blush, mauve, blue, pink etc. The boldness of Ultra Violet will soften and suddenly feel right at home. Be it one wall or all the walls in a room, ultra violet makes a showstopping statement when added as a wall colour. We love this as an accent wall and it is used to pass through space like an entry or hallway. Accenting the wall colour in an accessory or piece of furniture will give dimension to the colour as well. Furniture is also an easy way to add purple to a space. Though with larger pieces it is a bit of a commitment to the colour. 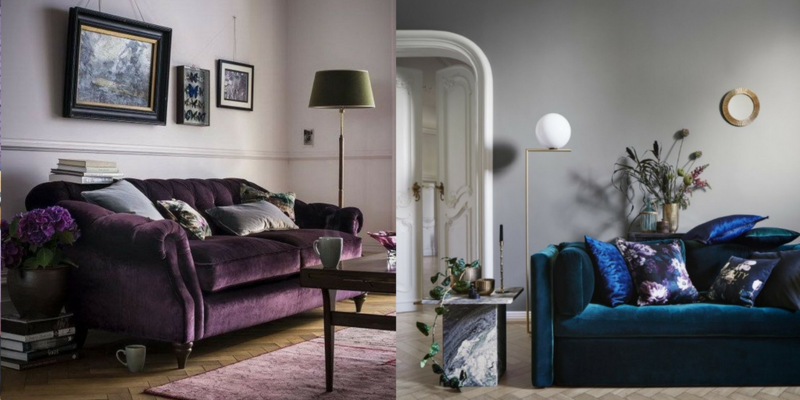 But a rich purple sofa or armchair in contrast against a white or light neutral wall is going to look stunning no matter the style of the room. 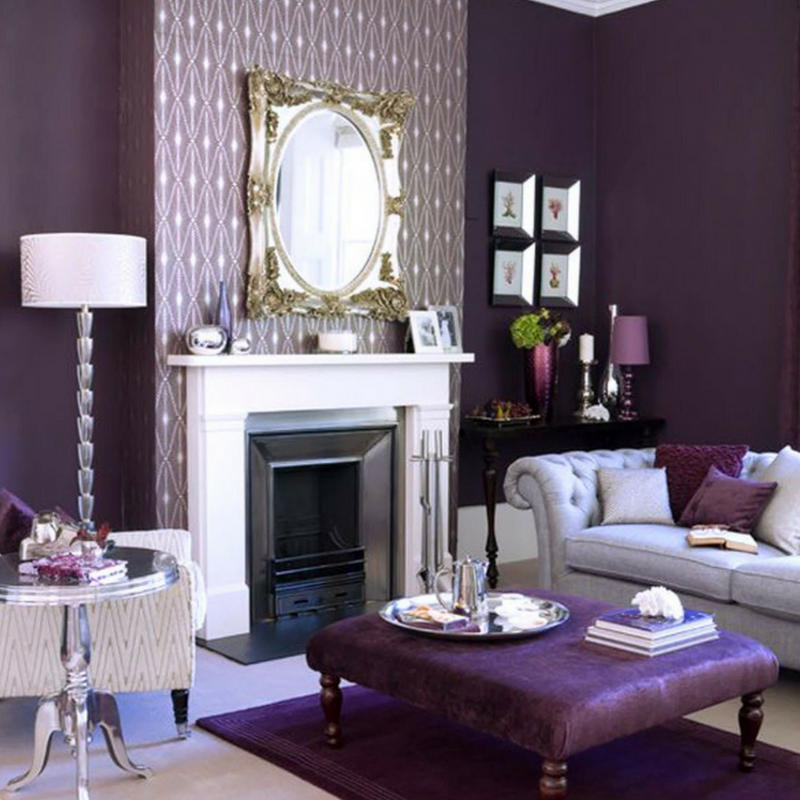 Purple is also a great colour to pair with velvet, whose popularity is going strong in home décor this year. Lighting is also so fun, and perhaps unexpected, way to add some purple to your interior. Whether just switching out shades or finding that perfect purple fixture there’s a surprising amount of purple lighting options out there, between ceiling and table lamps, to choose from. You can be less daring and use ultra violet in furniture pieces. Use it as the only pop of colour in a neutral space to draw the eye into the room. It truly gives an elegant and refined look in this dining room below, don’t you think? Not sure if you’re ready to swim in a sea of violet? Start small! A good rug may not always be cheap but compared to furniture and paint it’s easy to switch in and out as trends and your tastes change. It’s also a good option for those who are a bit wary about the colour. Since it’s on the floor it’s not in your immediate line out of sight all the time, but it’s still contributing to the colour palette of the room. Too much purple in the interior can be overwhelming, so it’s worth using some techniques that will tone down its intensity. 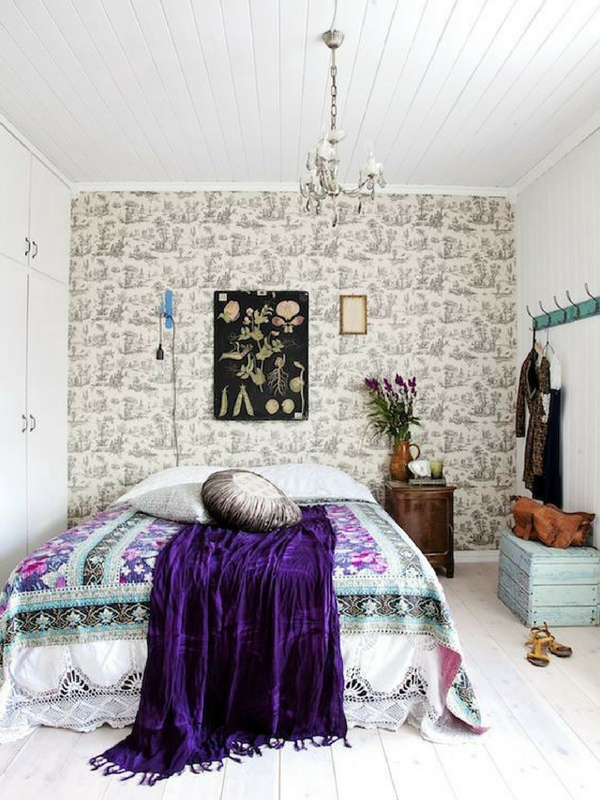 If you invest in purple rugs, it’s advisable to leave the walls white. Décor elements in Ultra Violet can work fantastically, if they are well combined. Accessories are the commitment-phobe’s best friend when it comes to trying out trends. Accessories can be found at almost any price point, are easily switched out. They can also be added to any room of the home. Purple pillows and throws will add a lovely pop of colour to neutral furniture. Whilst keeping you cosy warm during the winter. 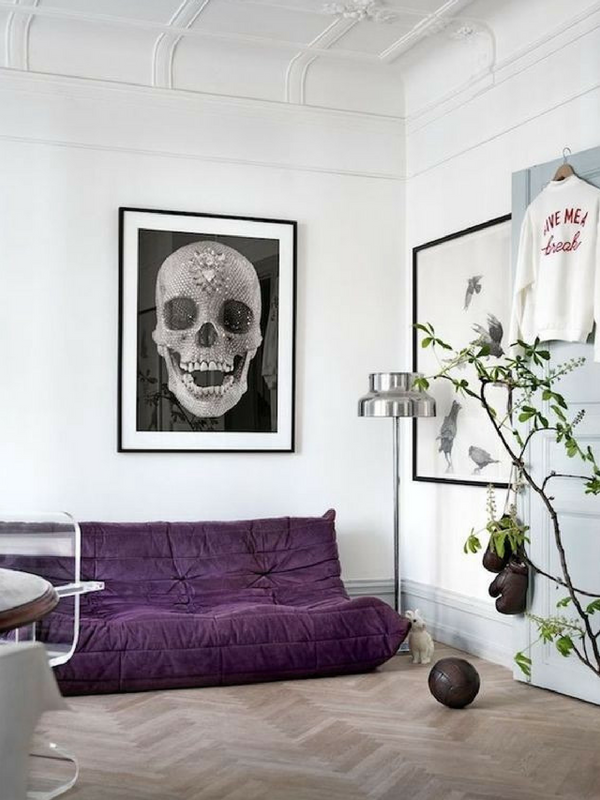 Art that has a lot of purple in it, or purple tapestries, can add purple to the wall in a less permanent way than paint. Purple table top accessories can add the hue to your tables and bookcases. Small accents around the home are affordable ways to experiment with the trend. For the faint of heart, subtle and timeless scatter cushions is one sure way of introducing the colour in a gentle way while still capitalising on its eye-catching effect. Choose larger-sized scatter cushions to draw attention and place emphasis on its position on your couch. The great thing about scatter cushions is that they are interchangeable and always easy to swap out. Some other examples of accessories would be artwork, candles, baskets, pillows and throw pillows. 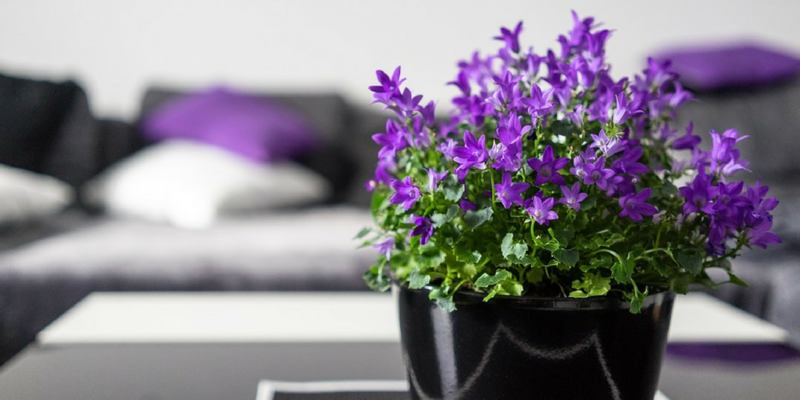 Flowers and plants are a great natural way to add purple to a room. If you often have bouquets of flowers in your home, start choosing ones with more purple flowers like hydrangeas, purple calla lilies, or lavender. And if you have more of a green thumb you can look for houseplants that come with purple flowers or foliage. If you don’t want to deal with real flowers at all you can always use purple floral prints for artwork, rugs, wallpaper, or textiles. Whether you end up with a few sprigs pf lilac in a jar, a pair of purple throw pillows, or a vintage rug with a few violet threads in it. The easiest way to start decorating with a new colour is to take baby steps. Hopefully, this post has inspired you to add a little purple to your décor. Or even if you still don’t like it for your own space. Hopefully, you can now at least admit that it has the potential to look great in a variety of styles. And for those who have always loved purple – this is your year to shine! Enjoy seeing your favourite colour pop up everywhere and be more accessible than ever. 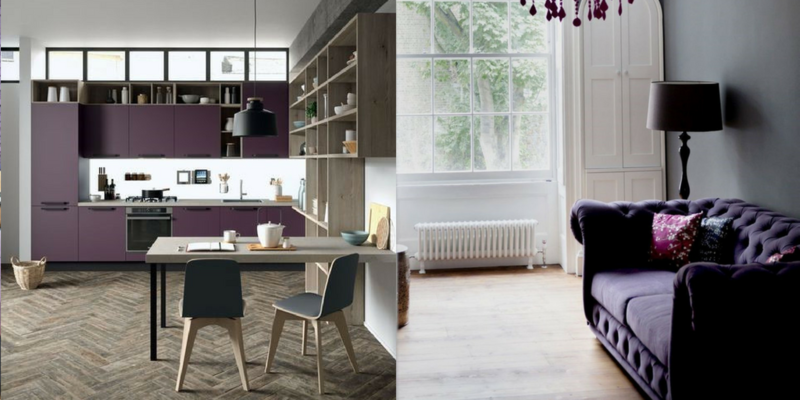 Will you be adding touches of Ultra Violet to your home this year?